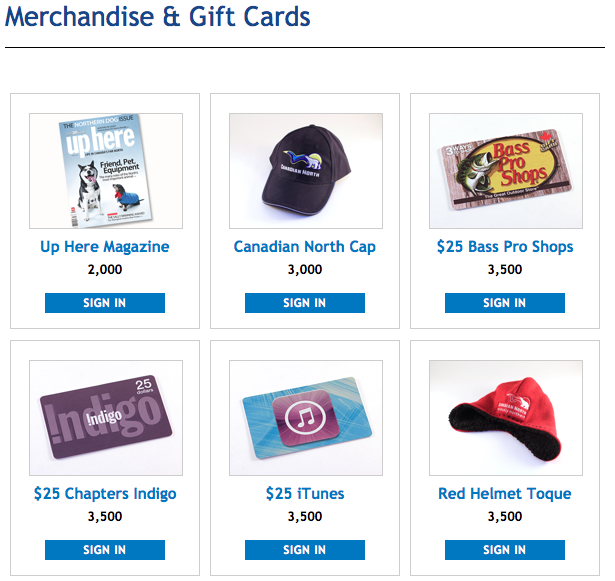 Canadian North announced today the launch of their own Frequent Flyer Program (FFP) called Aurora Rewards. Right off the bat one key piece of information sticks out, Aeroplan members will still earn Aeroplan Miles on Canadian North flights in addition to Aurora Rewards points! This is the only airline in Canada that will reward you miles/points in two FFPs on one single flight. On flights under 500 actual flight miles your points will be based upon a 500 mile flight (just like the example above). And as we mentioned above Aeroplan members will earn miles/points in both programs. In order to collect your Aeroplan Miles, you must be enrolled in the Aurora Rewards Program and include your Aeroplan® number on your profile. There are also some flight bonuses that we will detail on Rewards Canada tomorrow as we officially launch an Aurora Rewards bonus offers page on the main site! Let us know what you think of the new program! Are you going to join? Do you think you'll be able to benefit from it? Just comment below! Mar 31 Update: Promos for US Airways & TAM joining oneworld, Delta & Alaska remove elite benefits on each others flights and more! You take a few days off and what happens? 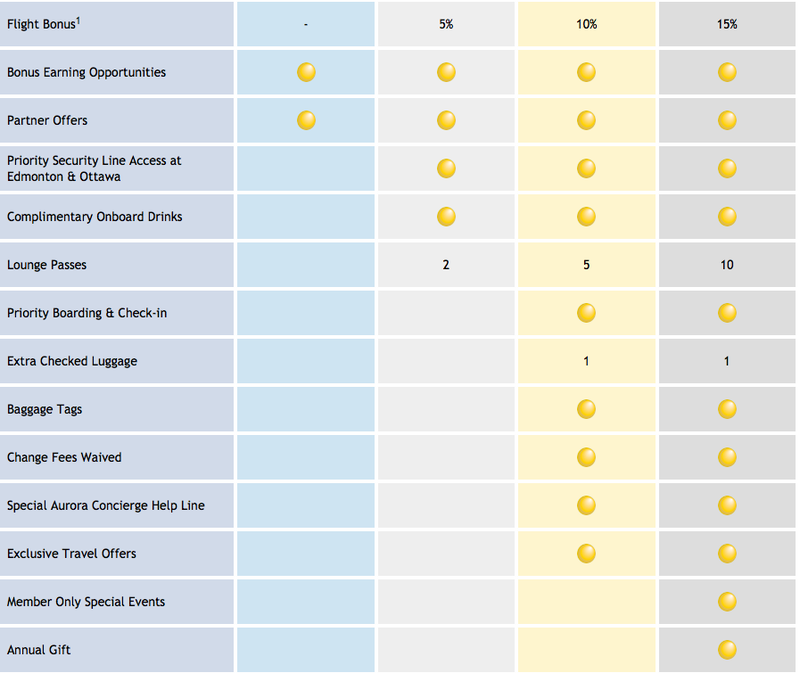 Tons of news, lots of bonuses surrounding the entry of US Airways and TAM into oneworld and more! 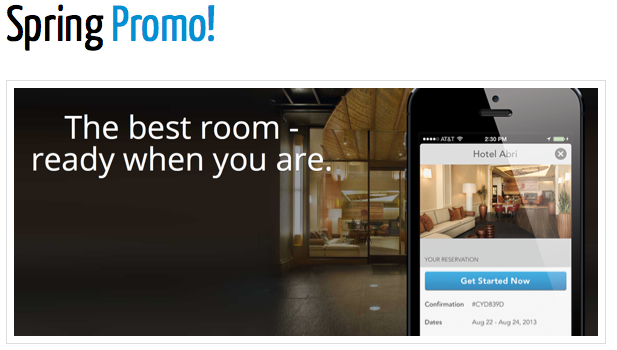 Today is the last day to register for Marriott's MegaBonus promotion and Hyatt's Endless Possibilities promotion. Delta Airlines is removing several benefits for Alaska Airlines Mileage Plan Elite members namely free checked bags are being removed for all levels plus priority check in and baggage handling along with several other benefits. See it all on Delta's site. Meanwhile Lucky over at One Mile Time also notes that Alaska Airlines has removed priority check in and free checked bags for Delta Medallion members. It looks like the fight for Seattle isn't close to ending just yet. In the bonus offers section check out the Discounted Saver Award offer from United to fly to Japan from Canada. This is a really good deal if you can take advantage of it and go to Japan in April. 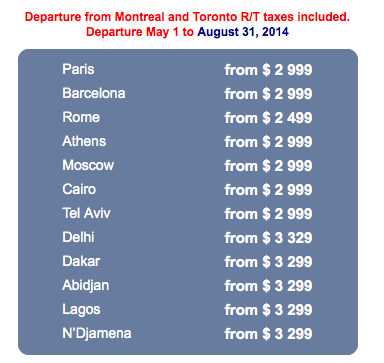 You will however incur some booking fees if you are traveling soon because of their 21 day window rule. In reality only travel in the last week of April or being a United Elite member will help you avoid those fees. Wednesday the 26th is the day for the release of our Top Travel Rewards Credit Card rankings! 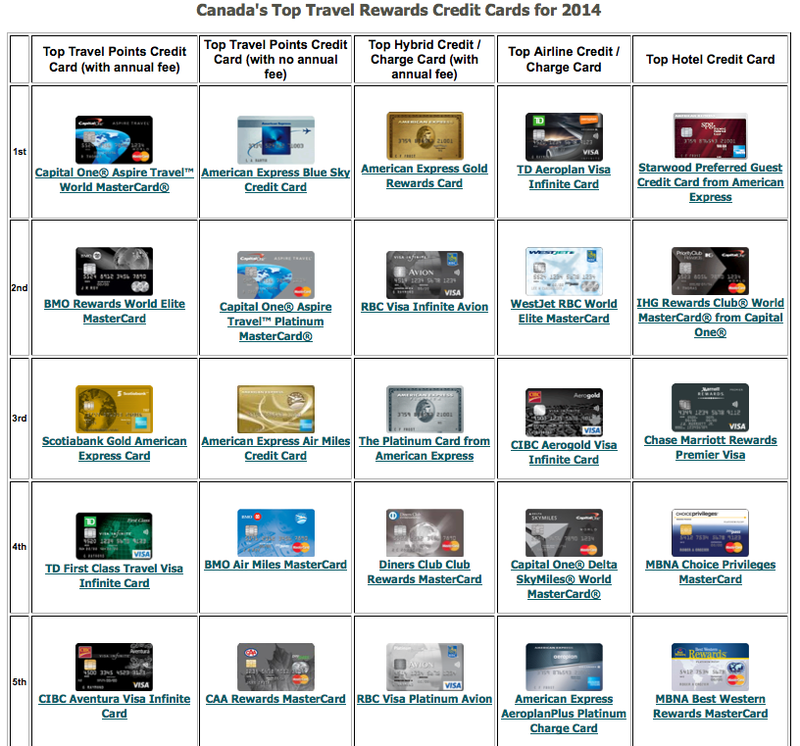 Big day here at Rewards Canada as we released our 2014 Top Travel Rewards Credit Card rankings! Earlier than usual we did this because of all the changes in the card industry in the last 8 months and to help Canadian's filter through the millions of dollars being spent on advertising by the card issuers! See the rankings here. PointsHound has a new promotion where you can earn 1,000 bonus miles/points in the PointsHound partner of your choice for stays of 3+ nights when you utilize their new free concierge service. You can always find this offer and others from PointsHound on our newly launched PointsHound Bonus page on main RC site. Today on RewardsCanada.ca we posted our sixth annual picks for Canada's top travel rewards credit cards. We have combed over 80 different credit cards offering travel rewards for Canadians and of those there are a few that really stand out. While it is practically impossible to give this question a perfect one card answer, we can breakdown the market of Canadian Travel Rewards credit cards into five major categories that these cards fall into. Visit rewardscanada.ca/topcc2014 for the complete details! For the complete article, details on each card plus runners up in each category please visit the full Canada's Top Travel Rewards Credit Card for 2014 page on the Rewards Canada website. Care to comment on our choices? Want to voice your opinion on the good and the bad of all the Travel Rewards Credit Cards in Canada. Share you views and experiences by leaving a comment below. Hyatt Regency Calgary goes above and beyond for a birthday stay! for their birthdays. It was one stay for the both of them whose birthdays are one month apart. At that time we told the employee working at check in that we were their celebrating their birthdays and not too long after checking in, milk and cookies were delivered to our room for their birthday. Not going on vacation this year during either one of our girl’s birthdays meant a staycation celebration and this time we did two visits to the Hyatt Calgary to celebrate each birthday separately. For the first stay in early February I put in the reservation notes that we were staying at the hotel once again to celebrate our older daughter’s birthday. Those notes apparently didn’t do anything to our reservation but when I mentioned it to the polite young man working the check in desk he made sure that milk and cookies were sent up to the room. For this first stay both the hot tub and steam Room were closed for renovations (apparently an emergency repair turned into them renovating them). A little disappointing since we didn’t get advance notice, the man at check in asked if I got the email announcing this but we had not. We were offered access to the Marriott’s Pool and Hot Tub if we liked but after we checked it out with the walk and all we decided to just hit the pool at the Hyatt and forego my wife’s favorite part of the hot tub and steam room. It was these repairs that stemmed a tweet from me to the Hyatt Calgary prior to our second birthday stay asking if the hot tub and steam room were open again and the response was that the hot tub was but the steam room wouldn’t be ready. That was good enough, so I booked our stay and tweeted Hyatt Calgary back stating we booked the stay for our daughter’s birthday. 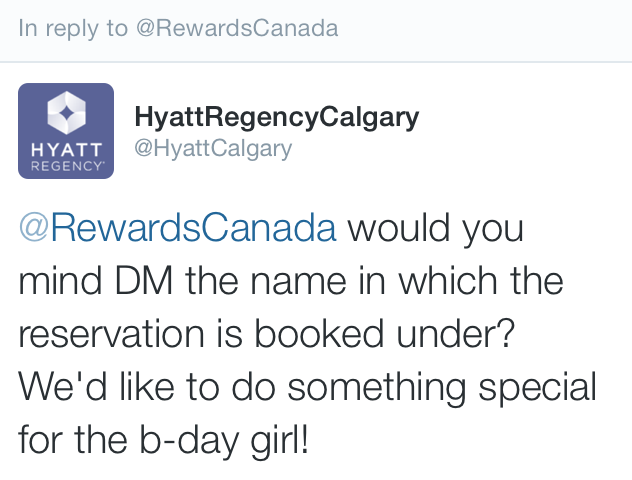 The conversation then continued and the Hyatt Calgary stated they wanted to do something for her birthday. We were thinking milk and cookies were on tap again! We checked in a little after 3pm on the Saturday of our stay, check in was painless and easy which was the opposite of the parking situation (they were cleaning the parkade, so no complaints about that). We were handed our keys with Regency Club access for our stay in room 2011. We were above the Regency Club floor and I had asked for a room on the Club floor but was told there was no availability and we soon found out why. We tapped the key on our door and my wife and youngest daughter entered the room first and all I heard were happy squeals! Why? Well there weren’t milk and cookies but balloons, flowers and gift basket waiting for our Birthday girl! To say the team at the Hyatt Regency Calgary went above and beyond is an understatement! Not only that we got one of the best rooms yet for all our stays (outside of a Suite upgrade once), a corner room with a view of the Calgary Tower and more. Room 2011 decorated for the birthday girl! The special treatment didn’t end there, later in the evening, Jeff in the Regency Club also went out of his way and had chocolate covered strawberries sent up for us! Here’s our thanks to the Hyatt Calgary for making a little girl's birthday weekend an astounding one! Welcome to another week here on RC! Today sees IHG's PointBreak go live and more! Aeroplan Mile Matching days are back! Aeroplan announced that it will match all miles donated by members to each of its ten Beyond Miles charitable partners as part of the 2014 Aeroplan Match Days. Miles will be matched on a 1 for 1 basis up to 500,000 Aeroplan Miles for each partner organization. This year, each organization has chosen its own match day, week or entire month and in turn, Aeroplan will match miles during the specified period. Engineers Without Borders (EWB) – Miles will be matched during the week of March 24-28th. Aeroplan Miles make it possible for EWB to join African partners in small business, agriculture, water and governance sectors. 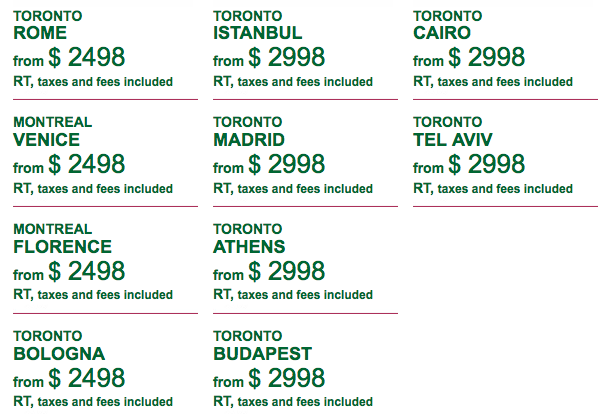 Médecins Sans Frontières (MSF) – Miles will be matched during a 24-hour period on April 16th. Last year, MSF used millions of donated miles to fly across Canada and to dozens of countries to support its medical humanitarian mission, to recruit field staff to work overseas, and to raise awareness of the needs of people in crisis. The Stephen Lewis Foundation (SLF) – Miles will be matched during a 48-hour period on May 27th and May 28th. In 2013, SLF used the miles to host a people’s tribunal – the African Grandmothers Tribunal – to shine a public light on the denial of African grandmothers’ human rights: six grandmothers from across sub-Saharan Africa presented their personal testimonies before four Tribunal judges in Vancouver, British Columbia. War Child Canada (WCC) – Miles will be matched during the week of June 2 – 8th. Last year, WCC used the miles to provide access to training opportunities for international staff working in some of the world’s most dangerous regions, and to connect with funders and supporters across the North America. Free The Children – Miles will be matched during the entire month of July. In 2013, Free The Children used the miles for partnership meetings across the country and around the world. The donated miles helped Free The Children make connections with like-minded individuals, companies and groups, which helps them grow. MusiCounts – Miles will be matched during the entire month of August. Last year, MusiCounts used the miles to offset travel costs, allowing them to visit more of the communities their grants impact and enabled artists to participate in fundraising events for MusiCounts. Miles have helped MusiCounts to put even more instruments into the hands of children who need them. Schools Without Borders (SWB) – Miles will be matched during the entire month of September. Last year, SWB used miles to help launch a number of new learning partnerships including bringing African indigenous educators to Toronto to share ancestral wisdom with the academic community as well as building a partnership with a film called Shadeism, which explores racism, specifically amongst women in communities of colour. Earth Day Canada (EDC) – Miles will be matched for the entire month of October. In 2013, EDC used the miles for transportation of their Hometown Heroes Award winners, general travel (plane, car rentals), accommodations (hotels) and office infrastructure (computers, servers etc.). Veterinarians Without Borders (VWB) – Miles will be matched during the entire month of November. Last year, VWB used the miles to send a team of volunteer veterinarians to Guatemala to provide critical animal health services and to train local vets; they also used miles to send its staff to South Sudan to help protect the livestock of refugees in Upper Nile State. The Air Canada Foundation (ACF) – Miles will be matched during the entire month of December. Aeroplan Miles are used to sustain the Air Canada Foundation Hospital Transportation Program helping children reach medical care not available in their communities. In 2013, more than 10 million Aeroplan Miles were used by fifteen pediatric hospitals across Canada to help sick children. You'll notice in the bonus offer section a Delta SkyMiles offer of 1,000 bonus miles for joining the program. This offer is a Hertz offer floating around from the Seattle area but it seems that anyone can sign up for it. As always YMMV. - 1,000 Bonus SkyMiles when you join the SkyMiles program. More... Until ? One of the best redemptions in the hotel loyalty program world is IHG Rewards Club PointBreaks offers and the latest set for stays March 24 - May 31st are now available for booking via the primary PointsBreaks page or via the individual hotel links below. There are more Canadian properties included this time and four high end InterContinental Hotel locations worldwide! The last few days of this week have really picked up in the travel rewards world! Starting this spring, we’re rolling out our new personal device entertainment system onboard select aircraft. With this new service, sponsored by the MileagePlus® Explorer Card, you can choose from over 150 movies and nearly 200 TV shows and watch them free of charge on your personal device. Most planes will be equipped with the new system very soon, and we’ll have it installed on most domestic aircraft by the end of 2014. We’ll begin on Airbus A319, Airbus A320, Boeing 747-400 and select 777-200 aircraft, followed by additional fleets. In the end, all United-operated flights will have some form of entertainment. 1. Download the latest United app from the iTunes® App Store if you’ll be using an Apple iOS device (iPad, iPhone or iPod). Laptops do not require an app. Android™ support is under development and is planned to be fully supported later this year. 2. Charge your device fully. All aircraft that will offer personal device entertainment will offer power outlets, with select fleets beginning installation of power outlets this year. Once you’re onboard, you’ll see two types of media. 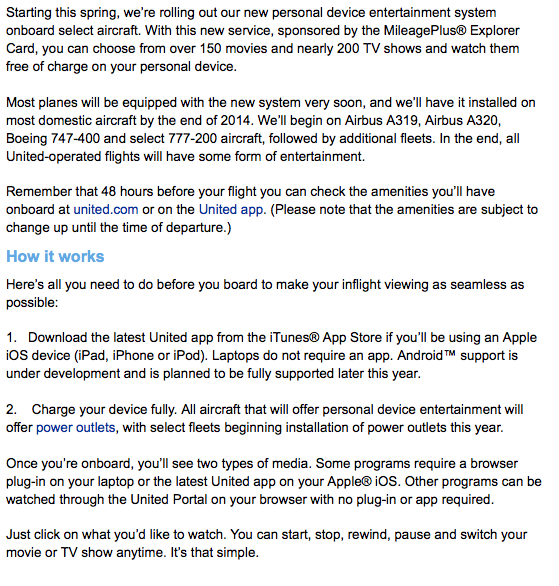 Some programs require a browser plug-in on your laptop or the latest United app on your Apple® iOS. Other programs can be watched through the United Portal on your browser with no plug-in or app required. Just click on what you’d like to watch. You can start, stop, rewind, pause and switch your movie or TV show anytime. It’s that simple.